The giant carnivorous anteosaur Doliosauriscus prowls through the tropical forest of equatorial Pangea - artwork by Dmitry Bogdanov - Wikipedia. Titanophoneus potens. Early Capitanian epoch. Length 3 to 5 m. Image © Kelly Taylor -- reproduced with permission. The Permian Dinocephalia -- the name means "terrible head" and is a reference to their fierce appearance, were in many ways the most archaic of the higher therapsids, and among the earliest as well. Although these synapsids showed therapsid adaptations such as the expansion of the ilium and the general posture of the limbs, they retained various primitive characters of the pelycosaurs. For example they had no secondary palate, and their dentary was of moderate size In the more mammal-like group, the cynodonts, the dentary grew increasingly large, until it constituted the entire lower jaw, which is the mammalian condition. The dinocephalians are also distinguished by their large size. The biggest were the size of an adult rhinoceros. The dinocephalians also developed pachyostosis, or thickening, of the bones in the skull, perhaps as an adaptation for intra-specific rivalry (head-butting) to procure territory or a mate. A number of writers have included the dinocephalians in the suborder Anomodontia, but it is now acknowledged they constitute a separate group. The dinocephalians are divided into three main groups, the mostly carnivorous Anteosauria (which included giants up to 6 meters and more in length), and the medium to very large herbivorous estemmenosuchids and Tapinocephalia. The tapinocephalians are again divided into two branches, the titanosuchids, which were large ponderous herbivores or omnivores, and the tapinocephalians, which were equally large and ponderous but more specialized as purely herbivores, both of which reached the size of an ox or even a rhinoceros in the larger species. The tapinocephalians also have the dubious distinction to be -- almost without dispute -- the ugliest vertebrates that nature has ever produced. The anteosaurs clearly preyed largely on their estemmenosuchid and tapinocephalian cousins. The Dinocephalians are an ancient group and their ancestry is not clear. 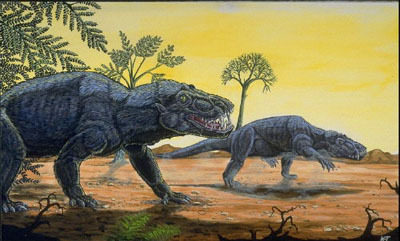 It is assumed that they must have evolved during the earlier part of the Ufimian/Roadian, or possibly even the Kungurian epoch, but no trace has been found; the fauna described by Olson of this age has turned out, on reinspection, to be not therapsid but misinterpretation of caseid remains [ref. pers. communication Christian Kammerer, and Sidor & Hopson 1995]. Even the earliest members, the estemmenosuchids and early brithopodids of the Russian Ocher fauna, (late Roadian? / early Wordian age) were already a diverse group of herbivores and carnivores. 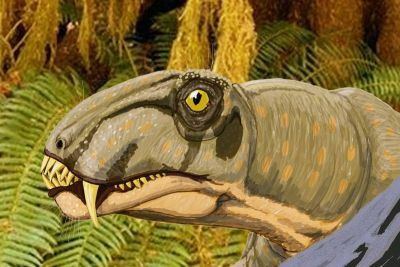 All Dinocephalians are distinguished by the interlocking incisor (front) teeth. Correlated features are the distinctly downturned facial region, deep temporal region, and forwardly rotated suspensorium. The way the jaw mechanism works is shown in the figure. The dinocephalian specialization of the jaw apparatus of the anteosaur Titanophoneus. The lower jaw closes with a simple hinge movement at the jaw articulation. Shearing contact between upper and lower teeth (allowing food to be more easily sliced into small bits for digestion) is achieved through keeping a fixed quadrate and a hinge-like movement at the jaw articulation. The lower teeth are inclined forward, and occlusion is achieved by the interlocking of the incisors. The dinocephalians were originally carnivorous, as represented by the anteosaurs, but even the earliest Estemmenosuchids, and then the somewhat later titanosuchids and tapinocephalids adapted to a herbivorous life-style, replacing the big Caseid pelycosaurs as the dominant vertebrate plant eaters. 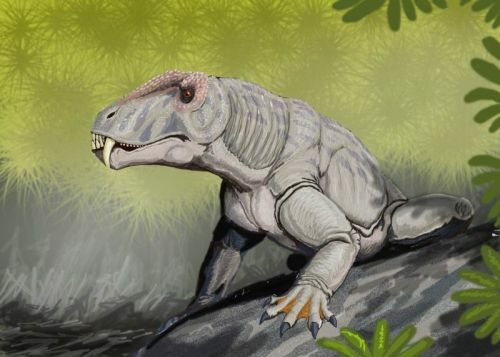 In all dinocephalians the synapsid opening for attachment of jaw muscles remained relatively small, and it is assumed that the power of the bite was provided by the sheer mass of the animals' jaw and muscles. This was a less efficient system than that developed by the anomodonts and theriodonts, but it clearly worked well, because these creatures dominated the large herbivore and large carnivore niche for some millions of years. The Wordian and Capitanian epochs, during which the dinocephalians flourished, is generally said to have lasted only a million or two years each. Such evolutionary change over such a short period (say 3 million years in all) is difficult to accept, especially if one looks at comparable evolutionary rates among Mesozoic dinosaurs and Cenozoic mammals, which are at least several times slower. To be sure, evolution can proceed very fast, perhaps over periods of only hundreds or thousands of years in small, geographically isolated island populations. However, in general and in the large picture, the average lifetime of a terrestrial animal species is on the order of some two to three million years. For this reason it may be that the conventional dating is probably slightly in error. Generally, generally there is an uncertainty of some five or ten million years either way with radiometric dating. Thus, the total Dinocephalian span (perhaps beginning in the Ufimian/Roadian or even the Kungurian and going through to the middle or late Capitanian age) may have been on the order of some twelve million years or more. At the end of mid-Permian time (mid or late Capitanian age) all the dinocephalians became extinct. The reason for this extinction is not clear, and the conventional explanation -- that they were out-competed by the more efficient herbivorous anomodonts and carnivorous theriodonts -- is about as persuasive as the old idea that the mammals out-competed the dinosaurs. Possibly disease, sudden climatic change, or other factors of environmental stress brought about their end. With their passing some of the most interesting prehistoric creatures this Earth has seen disappeared; they were replaced by much smaller dicynodonts and theriodonts. MAK000809. Range: from the Middle Permian. Phylogeny: Therapsida:::: Eotitanosuchia + *: Anomodontia + Neotherapsida. Characters: $? zygomatic arch bowed, with laterally expanded temporal fenestra [RS01]; $? ulna without distinct olecranon process [RS01]; $? pes V with only 3 phalanges [RS01]. Rubidge & Sidor (2001) [RS01]. 020219. Dinocephalia: Medium to large (1-3 m) big-bodied, short-legged "dog-faced" forms. Middle Permian to Late Permian of Russia & South Africa. Phylogeny: Eut herapsida: Neotherapsida + *: Estemmenosuchidae + (Anteosauria + Tapinocephalia). Skull usually massive, $ nares not terminal [RS01]; bone horns on maxillae or skull table; orbits small; temporal opening fairly large; some saggital crest; some with conspicuously thickened crania (head-butting? ); highly integrated; no secondary palate; $ premaxilla vomerine process absent (vomer contacts body of premaxilla directly) [RS01]; $ pterygoid transverse process anterior to orbit [RS01]; $ reflected lamina of angular smooth, without ridges or fossae [RS01]; $ foramen on medial jaw, between angular and prearticular [RS01]; incisors interdigitate; canines sometimes long; cheek teeth small; tail very long; hindlimb posture somewhat upright, but forelimbs sprawl; metapodial V at least as long & robust as Mp IV [RS01]; phalangeal formula 23345 / 23333; carnivores (early) or herbivores (later). Links: Early Mammal-like Reptiles; Schnellbestimmung anhand von typischen Schädelmerkmalen (in German); Notes From Other Vertebrates (go down to Christian Kammerer's comments); dinosaurs- titanophoneus potens; More Titanophoneus potens; BPI Palaeontology (includes life reconstruction); The first Karoo Reptiles and their origin; Early Mammal-like Reptiles; therapsid3a; therapsid4b Best on the Web). Image: Titanophoneus potens courtesy of mathematical.com. ATW020219. Range: Middle Permian (Roadian) of China. Location: Xidagou Formation, Dashankou, Yumen, Gansu Province, China. Remains: One near-complete skull (IGCAGS V 361), plus the right premaxilla, maxilla and dentary of a second (IVPP V12008). Size: Skull length 12-15 cm. Diagnosis: Cheng & Li (1997) Skull high, narrow, slender without pachyosteosis; orbit large; temporal fossa small; maxilla high, triangular-shaped, with top above canine and connecting with prefrontal; lacrimal large and extending forward; frontal with no boss and interorbital ridge; anterior border of attachment depression for lower jaw adductor on dorsal surface of postfrontal; small teeth present on palatine and transverse process of pterygoid; marginal tooth formula I 5/4, C 1/1, PC 6-8/6; incisors large, procumbent, interlocked, with labial talon pointer and lingual heel. Comments: Stenocybus acidentatus was a relatively small dinocephalian that lacked the pachyosteosis of more derived forms. It had a very high, narrow skull, triangular in dorsal view, with a large orbit compared to other dinocephalians. Cheng & Li (1997) assigned their new form to the Dinocephalia on the basis of the lingual heel on the incisors and the position of the lower jaw adductor, but regarded it as basal within the clade due to the small skull without pachyosteosis, small temporal fenestra, lower jaw articulation not anteriorly moved, maxilla with apex above the canine rather than posteriorly, and lacrimal extended anteriorly rather than short. While Cheng & Li (1997) placed Stenocybus outside the Anteosauria + Tapinocephalia clade, they seem to have only compared it with members of Anteosauria and not directly to members of Tapinocephalia. Rubidge & Sidor (2001) place it closer to Anteosauria than Tapinocephalia, again without much comment.